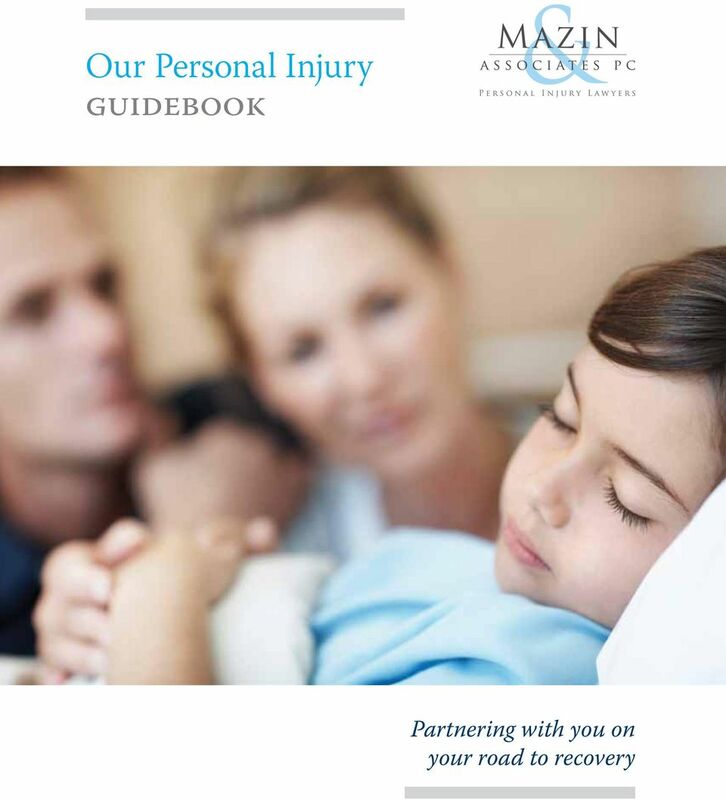 Download "Our Personal Injury Guidebook"
3 Injured? You Must Take the Following Steps 3 1. Contact the Police and advise them of all accident related details. 2. Write down the names and contact information of everyone involved in the accident and any witnesses; if you are involved in a motor vehicle accident, obtain the insurance information as well as the driver s licence and licence plate numbers of all other involved parties. 3. See your family doctor and advise them of your injuries. 4. Notify your Accident Benefits Insurance Provider of your involvement in a motor vehicle accident as soon as possible. 5. If you are unable to work or go to school, notify your employer or school and advise them of the reason for your absence. 6. Keep track of the names of all health professionals that you see in relation to your injuries from the accident be sure to also keep track of the dates and times of your visits. 7. Ensure that caregivers, whether professionals, friends or family members, record the time that they spend caring for you and the activities that they help you with. 8. Investigate whether you are eligible for treatment coverage or disability pay under any other insurance policies check with your employer, your school and/or private plan providers. 9. Keep the original receipts and invoices of all of your out-of-pocket expenses related to your accident, including payment for caregiving, medication, assistive devices, etc. 10. Contact Mazin & Associates PC to discuss your legal rights. 4 4 Our Promise to Our Clients We will ensure that all steps are taken in order for you to be fairly compensated for the injuries that you sustained We will meticulously investigate your accident to properly determine liability We will protect you from agreeing to an improvident settlement We will study every aspect of your case to ensure that it is accurately evaluated We will help to coordinate your medical treatment and ensure that you are getting the treatment you deserve We will not shy away from taking your case to trial if the insurer is being unreasonable. 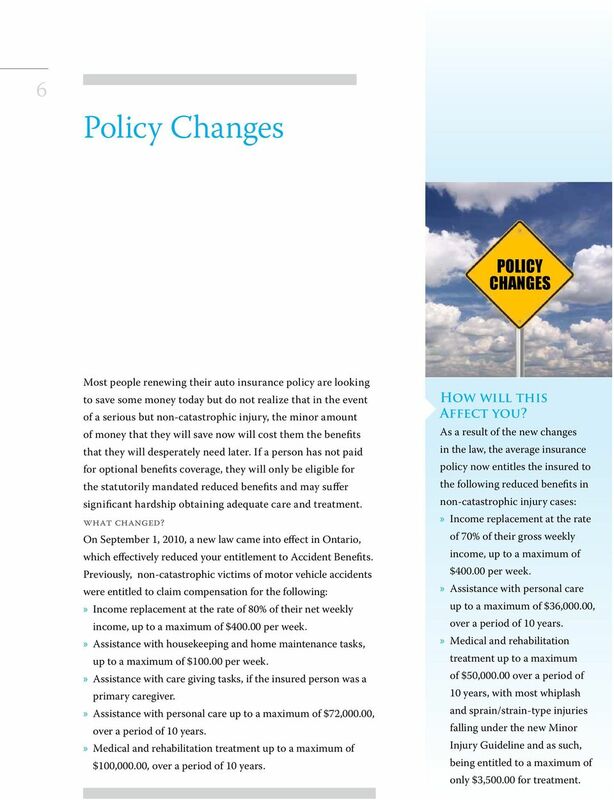 6 6 Policy Changes POLICY CHANGES Most people renewing their auto insurance policy are looking to save some money today but do not realize that in the event of a serious but non-catastrophic injury, the minor amount of money that they will save now will cost them the benefits that they will desperately need later. If a person has not paid for optional benefits coverage, they will only be eligible for the statutorily mandated reduced benefits and may suffer significant hardship obtaining adequate care and treatment. What Changed? On September 1, 2010, a new law came into effect in Ontario, which effectively reduced your entitlement to Accident Benefits. Previously, non-catastrophic victims of motor vehicle accidents were entitled to claim compensation for the following: Income replacement at the rate of 80% of their net weekly income, up to a maximum of $ per week. Assistance with housekeeping and home maintenance tasks, up to a maximum of $ per week. 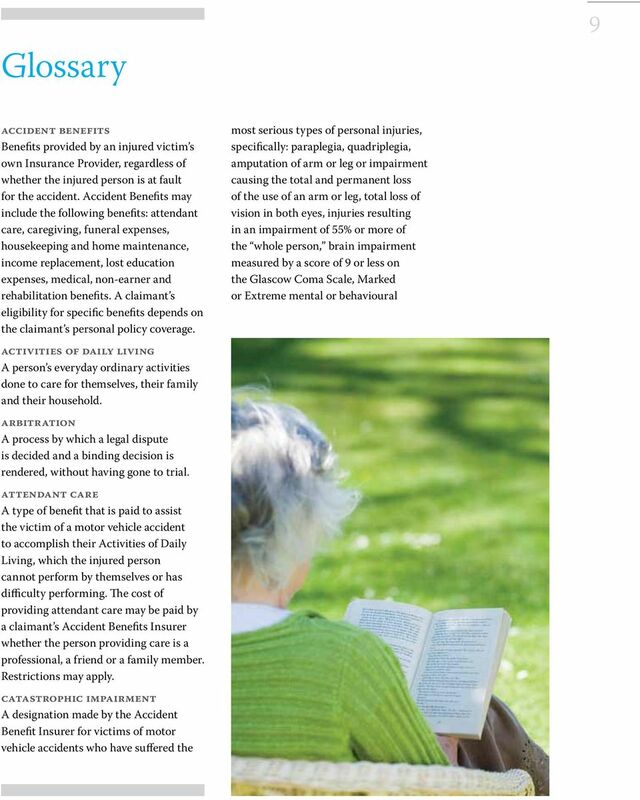 Assistance with care giving tasks, if the insured person was a primary caregiver. Assistance with personal care up to a maximum of $72,000.00, over a period of 10 years. Medical and rehabilitation treatment up to a maximum of $100,000.00, over a period of 10 years. How will this Affect you? As a result of the new changes in the law, the average insurance policy now entitles the insured to the following reduced benefits in non-catastrophic injury cases: Income replacement at the rate of 70% of their gross weekly income, up to a maximum of $ per week. Assistance with personal care up to a maximum of $36,000.00, over a period of 10 years. Medical and rehabilitation treatment up to a maximum of $50, over a period of 10 years, with most whiplash and sprain/strain-type injuries falling under the new Minor Injury Guideline and as such, being entitled to a maximum of only $3, for treatment. 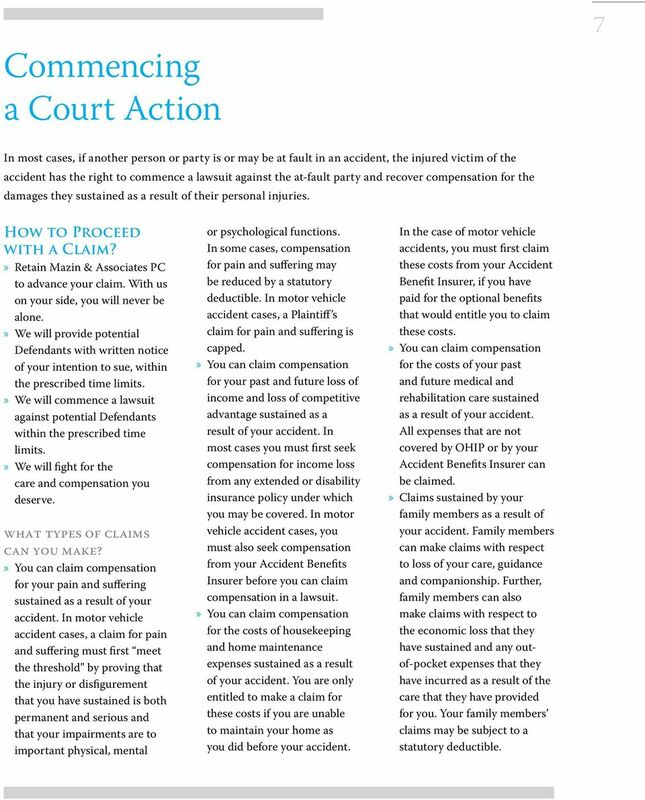 7 Commencing a Court Action 7 In most cases, if another person or party is or may be at fault in an accident, the injured victim of the accident has the right to commence a lawsuit against the at-fault party and recover compensation for the damages they sustained as a result of their personal injuries. How to Proceed with a Claim? 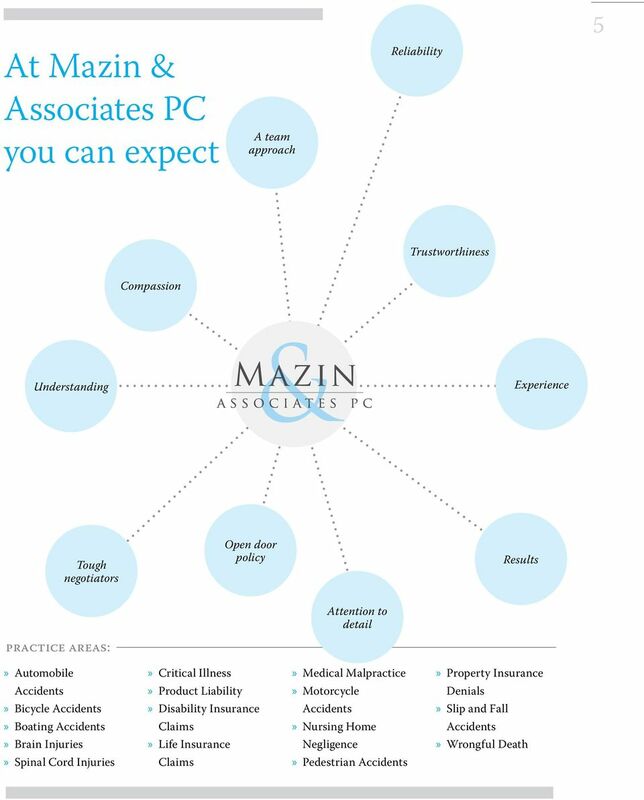 Retain Mazin & Associates PC to advance your claim. With us on your side, you will never be alone. We will provide potential Defendants with written notice of your intention to sue, within the prescribed time limits. We will commence a lawsuit against potential Defendants within the prescribed time limits. We will fight for the care and compensation you deserve. What types of claims can you make? You can claim compensation for your pain and suffering sustained as a result of your accident. In motor vehicle accident cases, a claim for pain and suffering must first meet the threshold by proving that the injury or disfigurement that you have sustained is both permanent and serious and that your impairments are to important physical, mental or psychological functions. 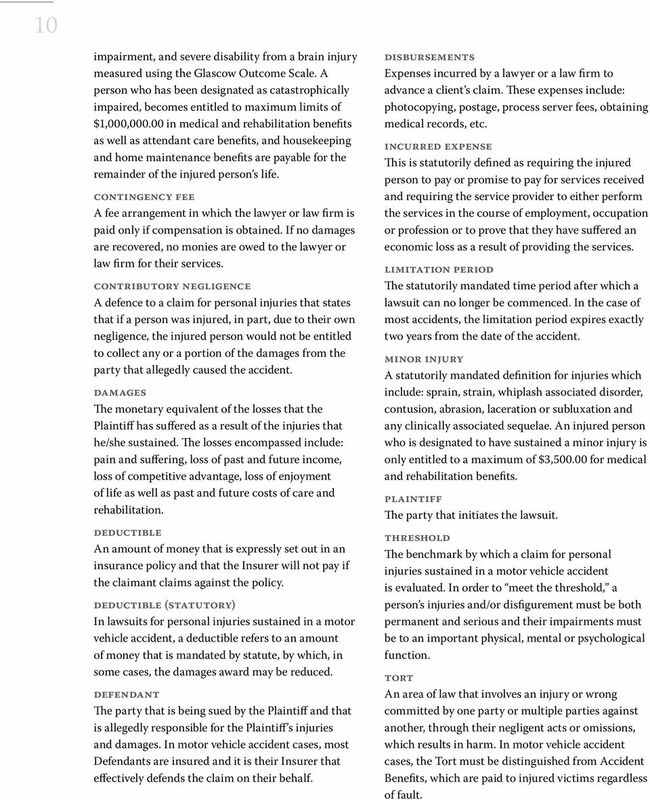 In some cases, compensation for pain and suffering may be reduced by a statutory deductible. In motor vehicle accident cases, a Plaintiff s claim for pain and suffering is capped. You can claim compensation for your past and future loss of income and loss of competitive advantage sustained as a result of your accident. In most cases you must first seek compensation for income loss from any extended or disability insurance policy under which you may be covered. In motor vehicle accident cases, you must also seek compensation from your Accident Benefits Insurer before you can claim compensation in a lawsuit. You can claim compensation for the costs of housekeeping and home maintenance expenses sustained as a result of your accident. You are only entitled to make a claim for these costs if you are unable to maintain your home as you did before your accident. In the case of motor vehicle accidents, you must first claim these costs from your Accident Benefit Insurer, if you have paid for the optional benefits that would entitle you to claim these costs. You can claim compensation for the costs of your past and future medical and rehabilitation care sustained as a result of your accident. All expenses that are not covered by OHIP or by your Accident Benefits Insurer can be claimed. 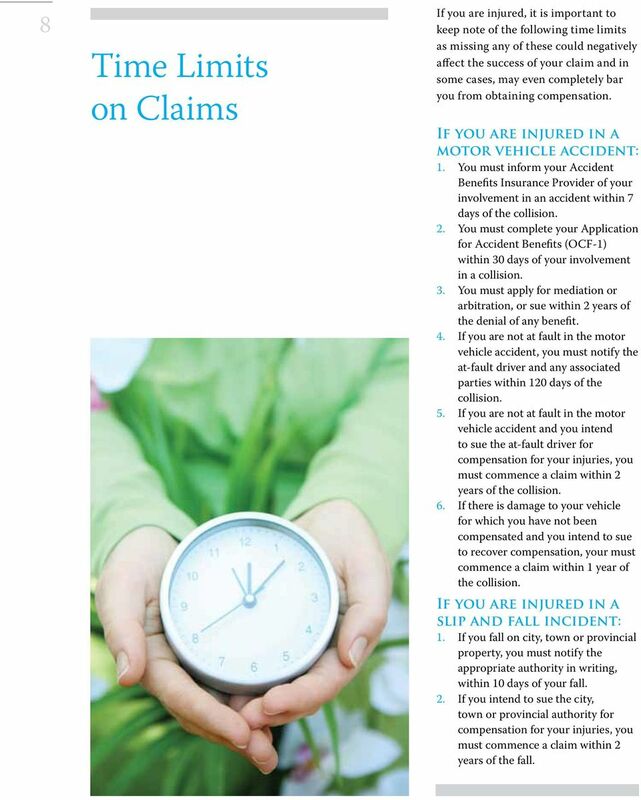 Claims sustained by your family members as a result of your accident. 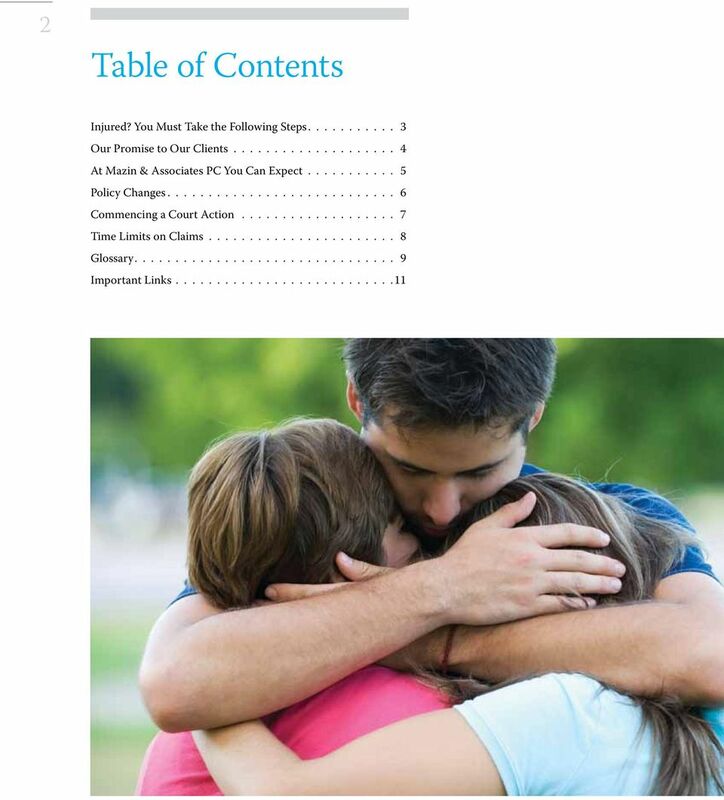 Family members can make claims with respect to loss of your care, guidance and companionship. Further, family members can also make claims with respect to the economic loss that they have sustained and any outof-pocket expenses that they have incurred as a result of the care that they have provided for you. Your family members claims may be subject to a statutory deductible. 8 8 Time Limits on Claims If you are injured, it is important to keep note of the following time limits as missing any of these could negatively affect the success of your claim and in some cases, may even completely bar you from obtaining compensation. 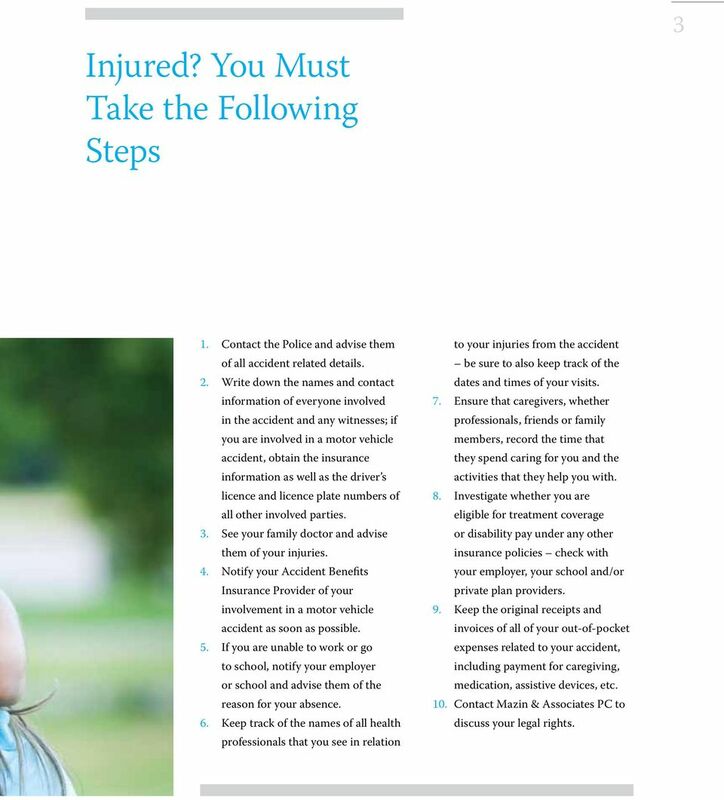 If you are injured in a motor vehicle accident: 1. You must inform your Accident Benefits Insurance Provider of your involvement in an accident within 7 days of the collision. 2. You must complete your Application for Accident Benefits (OCF-1) within 30 days of your involvement in a collision. 3. You must apply for mediation or arbitration, or sue within 2 years of the denial of any benefit. 4. If you are not at fault in the motor vehicle accident, you must notify the at-fault driver and any associated parties within 120 days of the collision. 5. If you are not at fault in the motor vehicle accident and you intend to sue the at-fault driver for compensation for your injuries, you must commence a claim within 2 years of the collision. 6. If there is damage to your vehicle for which you have not been compensated and you intend to sue to recover compensation, your must commence a claim within 1 year of the collision. If you are injured in a slip and fall incident: 1. If you fall on city, town or provincial property, you must notify the appropriate authority in writing, within 10 days of your fall. 2. If you intend to sue the city, town or provincial authority for compensation for your injuries, you must commence a claim within 2 years of the fall. 10 10 impairment, and severe disability from a brain injury measured using the Glascow Outcome Scale. A person who has been designated as catastrophically impaired, becomes entitled to maximum limits of $1,000, in medical and rehabilitation benefits as well as attendant care benefits, and housekeeping and home maintenance benefits are payable for the remainder of the injured person s life. Contingency Fee A fee arrangement in which the lawyer or law firm is paid only if compensation is obtained. If no damages are recovered, no monies are owed to the lawyer or law firm for their services. Contributory Negligence A defence to a claim for personal injuries that states that if a person was injured, in part, due to their own negligence, the injured person would not be entitled to collect any or a portion of the damages from the party that allegedly caused the accident. Damages The monetary equivalent of the losses that the Plaintiff has suffered as a result of the injuries that he/she sustained. The losses encompassed include: pain and suffering, loss of past and future income, loss of competitive advantage, loss of enjoyment of life as well as past and future costs of care and rehabilitation. Deductible An amount of money that is expressly set out in an insurance policy and that the Insurer will not pay if the claimant claims against the policy. Deductible (Statutory) In lawsuits for personal injuries sustained in a motor vehicle accident, a deductible refers to an amount of money that is mandated by statute, by which, in some cases, the damages award may be reduced. Defendant The party that is being sued by the Plaintiff and that is allegedly responsible for the Plaintiff s injuries and damages. In motor vehicle accident cases, most Defendants are insured and it is their Insurer that effectively defends the claim on their behalf. Disbursements Expenses incurred by a lawyer or a law firm to advance a client s claim. These expenses include: photocopying, postage, process server fees, obtaining medical records, etc. Incurred Expense This is statutorily defined as requiring the injured person to pay or promise to pay for services received and requiring the service provider to either perform the services in the course of employment, occupation or profession or to prove that they have suffered an economic loss as a result of providing the services. Limitation Period The statutorily mandated time period after which a lawsuit can no longer be commenced. In the case of most accidents, the limitation period expires exactly two years from the date of the accident. Minor Injury A statutorily mandated definition for injuries which include: sprain, strain, whiplash associated disorder, contusion, abrasion, laceration or subluxation and any clinically associated sequelae. An injured person who is designated to have sustained a minor injury is only entitled to a maximum of $3, for medical and rehabilitation benefits. Plaintiff The party that initiates the lawsuit. Threshold The benchmark by which a claim for personal injuries sustained in a motor vehicle accident is evaluated. In order to meet the threshold, a person s injuries and/or disfigurement must be both permanent and serious and their impairments must be to an important physical, mental or psychological function. Tort An area of law that involves an injury or wrong committed by one party or multiple parties against another, through their negligent acts or omissions, which results in harm. In motor vehicle accident cases, the Tort must be distinguished from Accident Benefits, which are paid to injured victims regardless of fault. 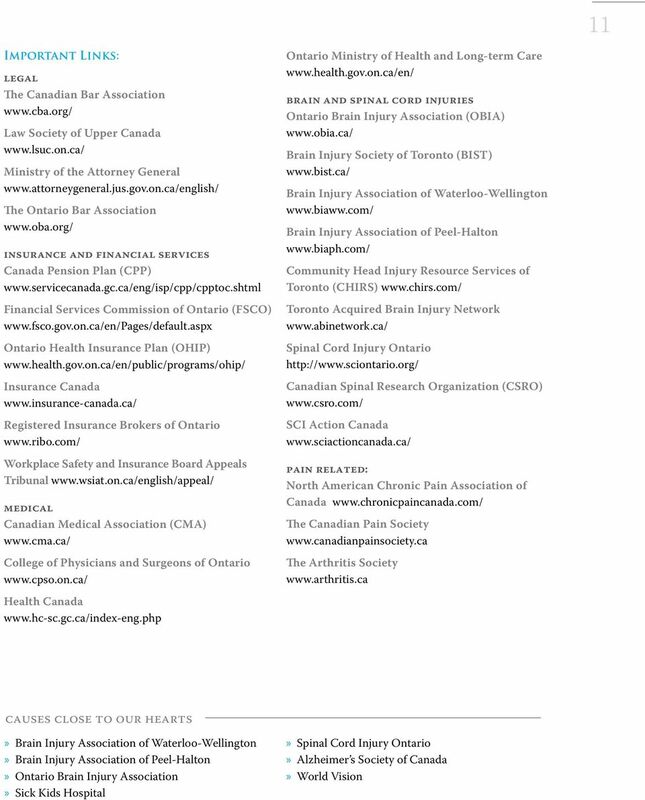 IN THE MATTER OF the Insurance Act, R.S.O. 1990, c.i.8, as amended, and Ontario Regulation 668.